Just to complete the four seasons in one weekend the riders arrived at a race HQ basking in warm summer sun so setting the stage for the queen stage of the Tour Of Omagh (July 29). A final review of timings to reflect the severity of the stage meant the limit group carried a 4.5 Minute advantage over the scratch on the final stage. Right from the off a number of these women Ellie Mc Ardle (Cycling Ulster) , Lyndsey Bryce (Leinster) and Ciara Ni Fhlathartaigh (Orwell) were determined to make it a hard chase for the scratch group and with almost 4 mins of an advantage approaching Drumquin it looked to be paying dividends as the scratch group was being carefully contained by The TC Riders protecting the pink jersey. This was to change very quickly between Drumquin and Castlederg with Jennifer George in the Pink Jersey launching an attack of the front which was quickly covered by the group. However the increase in speed meant the gap to the front group had reduced dramatically, and by the time the race reached Castlederg – the cars between the groups were removed. The two groups eventually merged on the descent to Victoria Bridge , and from then to the finish we witnessed some super racing, first to go on the attack just after the group merged was Jennifer bates from Cycling Leinster, she was to be caught on the climb out of Victoria Bridge and then her team Maria Claffey (Leinster) was to go off the front open a 15 second lead before being absorbed by the group. The next break was to be the decisive one as Fiona Guihen from Leinster and the white jersey holder Lara Gillespie were to attack on the final climb into Gortin before the riders reached the Category 1 Climb on Lenamore Road. Gillespie was to forge on quickly distancing herself from Guihen as they approached the climb. By the foot of the climb Gillespie has opened a 30 second lead with only George in the pink Jersey closing the gap with a smaller group further back. The pink and white jerseys crested the climb together and had a lead of over a minute on a group of two – Isabel Oakes (Smugglers Cc) and Ellen Barker (IOM) , with another group of five, Maria Claffey, Fiona Guihen, and Aisling Flanagan all Leinster with Sofie Loscher (Womens Commission) and Eleanor Davies (IOM) a further 40 seconds back with the rest of the bunch in pieces on the climb. A final word must go to host club Omagh Wheelers who strive to make the Women’s race better each year. 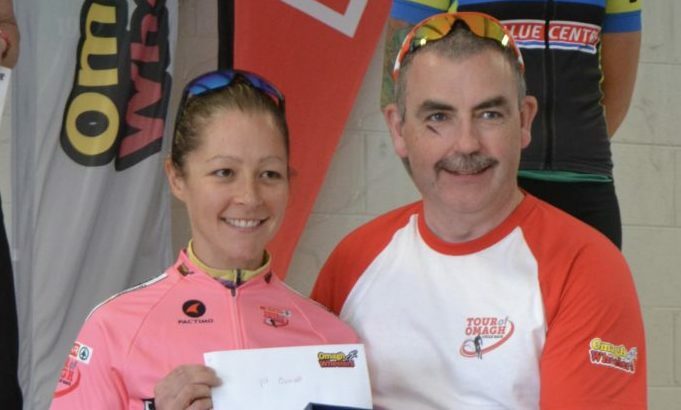 In the 2018 edition , they have equal prize money, new categories, and the host club’s willingness to embrace and work with the Women’s Commission of Cycling Ireland with a new grading system . All made for a fantastic weekend of racing. The event catered for women right across the spectrum of abilities and sent all riders and teams home happy.